There are many ways you can look at a river — the body of water, the rocks that are found in it, the topography of the land through which it flows, the shrines and towns that are built on its banks, the people who have had to swim or sail across it, the dams that are built on it and those who have drowned in it. Each river has a different story. Some have many stories. 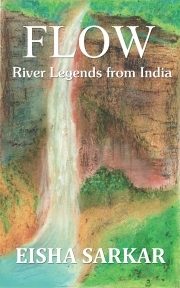 Flow is a collection of legends of the rivers of India. Some of these legends are very popular, others lost like the rivers themselves. Journey through the subcontinent from the north to the south, while coursing through this book, to unravel a tapestry of history, myth and mystery. Eisha Sarkar is a journalist by profession and an explorer by nature. Science is her passion and writing helps her connect with people. When not writing, she lectures graduate students at the university on the ways of the media or travels to observe, with keen interest, people of various cultures and tribes. She loves India’s history, its diverse cultures and cuisines. Eisha has written for publications and books such as The Times of India, Mumbai Mirror, Times Wellness, Downtown Plus, Bombay Times, Free Press Journal, Youth Incorporated, Femina, NID’s Young Designers 2011, Chicken Soup for the Indian Soul: On Friendship, UNICEF’s Success Stories in Education and Early Childhood Education, India Guide: Gujarat and My Mother. Another book by Eisha published by Typeshype is The Song of the Lord.